You get to choose the color, saddle, bridle and even the eye color of your horse. You get to ride your horse on beautiful trails and compete in events that are fun but sometimes tough. You can also own more than one horse! This game is AMAZING! I got it for my 6th birthday, and I am now 13. And I still have it. In the game, you compete with several Western competitions with a variety of different events. Winning competitions earns you a higher status, new saddles and blankets, and even more horses! Do you need a username and password? i have it and i have many accounts and their all boys. i'm a girl 1 has 2 horses and other has 1. i love to play the game with my cousin, we always run away from each other and try 2 find each other and i always find her. i would totally recommend(spelling correct or wrong) this game for anyone with a ps3(play station 3). I love this game!!! To me this is the most challenging, virtual, and very fun game!!!!!!!!!! I know for a fact that if u added a little... Actually a lot of you know wild mustangs and breed horses you can make many little girls love, love, love your game. I also know me and lots of my friends will buy it because we honestly always dream someone would make such an amazing game......... Buy!!!!! Your turn! 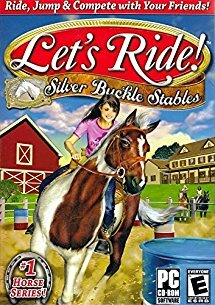 More Horse Computer Game Reviews.